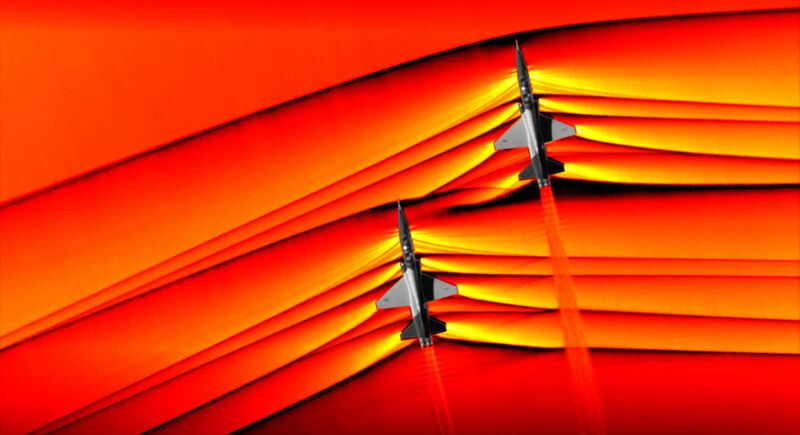 It wasn't an easy shot to get, but the end results of NASA's efforts to capture air-to-air images of supersonic shockwaves sure seem worth it. To take these unprecedented photos, the space agency updated the imaging system on one of its Beechcraft B200 Super King Air aircraft. NASA scientists upgraded the camera so that it could capture a wider field of view, improved its connection to data storage, and increased its frame rate to 1,400 frames per second. Then, the B200 flew up to about 9,100 meters. Meanwhile, two T-38 jets flew in formation, less than 10 meters apart, only about 600 meters away from the B200 aircraft. All three planes had to be in the right place, and as a result, the camera system took exceptionally high-quality images of shockwaves created by the two T-38 aircraft and the interaction of the shockwaves between the two jets.